There’s a great big world beyond the entrance to your vault, and even though the outside world may have fallen into disarray, that doesn’t mean your wanderings through it must do the same. 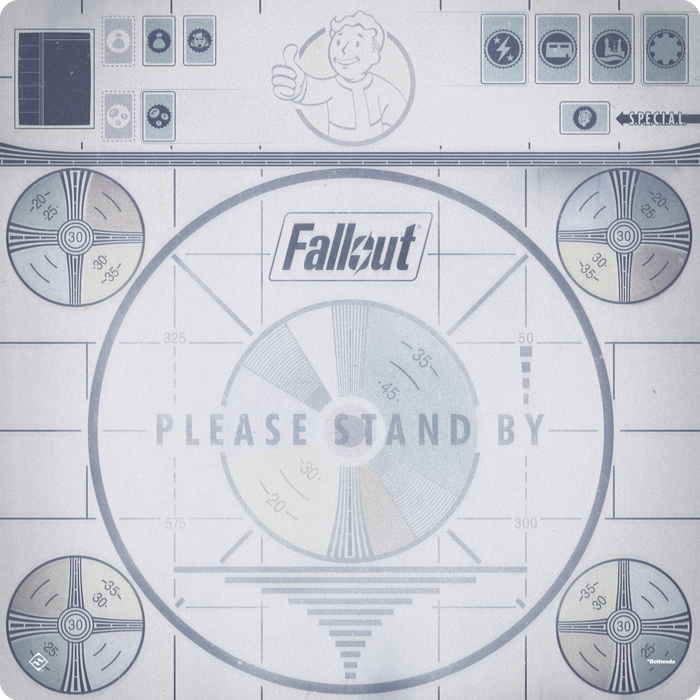 Fantasy Flight Games is happy to announce the Please Stand By Gamemat for Fallout: The Board Game! The Please Stand By Gamemat gives you the perfect canvas to create your own Wasteland, with plenty of space for you to set up your map tiles for a standard scenario or to expand into the new territory provided in the upcoming New California expansion. No matter what situation you find yourself in, the playmat draws you even deeper into the world of Fallout with the iconic “Please Stand By” imagery of the critically acclaimed video game series. In addition to providing a smooth, slip-resistant surface for your map tiles, the playmat also helps you stay organized while roaming across the irradiated landscape. Next to the play area, you’ll find convenient spaces for the cards you’ll collect during your adventures, including spots for the encounter, loot, and asset decks, ensuring that everything you need is within easy reach of all players! Whether you’re an expert at wandering the wasteland or if you can’t tell a radroach from a bloatfly, the Please Stand By Gamemat is sure to enhance your gaming experience, offering a beautiful and well-organized area to play out your own stories in post-nuclear America. Make your Fallout: The Board Game experience truly special by ordering your own Please Stand By Gamemat (ZX04) from your local retailer or online through our website today!